Maybe you are hoping your sweetie pops the question this Valentine's Day. Or maybe you're the anxious one, trying to figure out the best place or most appropriate time to ask your honey to marry you. If you are among the thousands who become engaged, chances are you won't say or hear: "Will you marry me? Now let's draw up a prenuptial agreement." 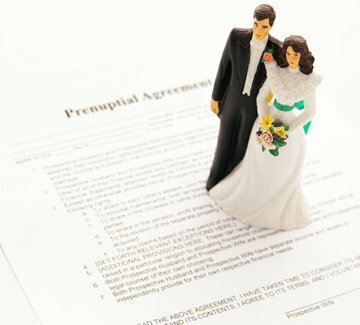 But in some cases, a prenuptial agreement or "prenup" might be appropriate, depending upon several factors — especially age, financial status, children and religion. St. Louis attorney Cynthia Holmes considers a prenup "a good idea," especially for older couples contemplating a second marriage. Often, mature adults have built up an estate, and many have children who either need to be provided for or who expect to receive a portion of the parent's estate. "It's good to talk about what your intentions are," Holmes said. "Discuss what is going to happen to your estate when you die, especially if there are children involved." Several issues should be settled, even before the couple marries. What will happen to the house if it belongs solely to one party? Will all the deceased's assets go to the surviving spouse, or will they be divided among the spouse and children? Couples also must determine whether they will mix their assets, maintain separate accounts or tailor a financial approach. Young couples embarking on married life for the first time may or may not need a written agreement. "It can be a good idea if there is a huge financial disparity," Holmes explained. Perhaps one individual comes from a wealthy family and expects a large inheritance, or has worked a while and saved, or owns a business. Or perhaps one party has amassed a sizeable debt, such as student loans or from a business failure. "But even if they are on the same financial level, it's most important to have the discussion about money, whether they have a written agreement or not," she added. "Frequently, people don't set up an estate plan at all. Everyone's needs are different, but everyone does need a will and a plan." While having a prenup for financial reasons might be advisable, how would one affect the pair emotionally and spiritually? A financial agreement might spare a family from a fight when a parent passes away. As more mature people marry again, an agreement is "a very good idea," noted family counselor Walter Coplen of Columbia-based Coplen Wright and Associates. He agrees that an agreement is appropriate for an older couple, in which at least one person is marrying a second time. "In later ones [marriages], it seems an assurance, particularly if the individuals have children," he said. Couples draw up written agreements for other reasons, as well. They often choose a religious prenuptial agreement if they come from different faith traditions and expect to have a family. Most of these prenups spell out in which religious tradition the children will be raised. For example, a Catholic and a Protestant who decide to marry might agree to raise their children as Protestants. These agreements are often used to force a parent to raise children in the chosen tradition even if the couple divorces. Couples who choose to draw up a written agreement need to be aware of state law. Prenups are generally enforceable in Missouri as long as they are contracted before marriage. The agreement must be "reasonable" and "fair," and both people must understand the document and act in "good faith." Any agreement can be challenged in the event of divorce. Couples need to be aware that in Missouri, the court is not bound to a prenup regarding children but might consider it during deliberation. Choosing to draw up an agreement over religious education and other issues, sometimes even financial ones, could indicate problems between the parties. "I think if it's a first marriage, a prenuptial agreement seems to cause a trust issue," Coplen said. Some pastors agree that people choosing a prenup need to consider why they want one. Jason Edwards, pastor of Second Baptist Church in Liberty, usually does not broach the subject with couples he counsels. "The Christian perspective on what a marriage is…is that it is a covenant between each other and God…. It's a promise…a loving, lifelong covenant," Edwards explained. "I think the biblical assumption is that if you get married, you're going to stay married." But he also is well aware of the reality that many marriages end. That's why he recommends couples see a trained marriage and family counselor before they tie the knot. For Churchnet Executive Director Jim Hill, trust is also critical. "I see the validity of using an agreement for financial reasons…. But if a prenuptial agreement is a way to resolve trust issues, then maybe you shouldn't get married," he said. While a prenup might be practical, Holmes believes, "the only downside, besides the cost of an attorney, is that it seems so unromantic."